For the third year in a row, Earworm has created his "United State of Pop" mashup. 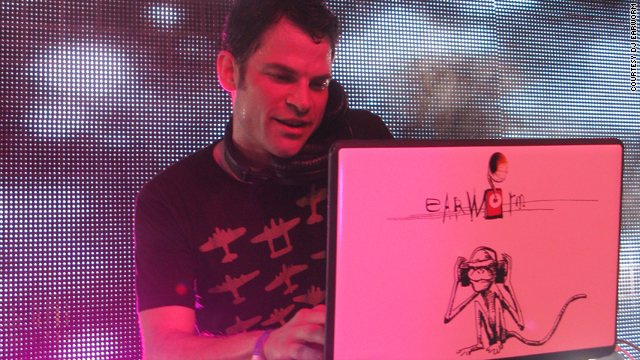 DJ Earworm has created a mashup of Billboard's top 25 songs into one track. (CNN) -- Some great songs were released in 2009 and thanks to a mashup master named DJ Earworm you can listen to the top 25 releases from the year in just under six minutes. Earworm, whose real name is Jordan Roseman, has for the third year in a row created his "United State of Pop" mashup compilation of Billboard's top 25 songs into one comprehensive track. For 2009 those hits include the Black Eyed Peas' "Boom, Boom, Pow," Lady Gaga's "Poker Face," Taylor Swift's "Love Story," The All-American Rejects' "Gives You Hell," Jay Sean's "Down" and 20 other catchy songs from the last 12 months. Roseman started making mashups when he was working part time as a computer programmer back in 2003 after graduating from the University of Illinois with a degree in computer science and music theory. "Basically I was just messing around with some music and making mix tapes for friends when I showed some of my stuff to a friend, DJ Adrian, who was working at Club Bootie, the first mashup club in San Francisco," Roseman said. "He got me to put them online and then they just started to take off." A mashup is a song or compilation created by blending two or more songs. To do it seamlessly means overlaying the vocal track of one song with the music track of another. Mashup artists are usually able to skirt copyright laws under the "fair use" doctrine of copyright law. Roseman's take on sampling other people's creative content is that you have to cooperate with an artist who feels that their copyright has been infringed upon. "I think if you transform it enough it's ok. I have always cooperated in the theoretical possibility that someone would want me to take it down," Roseman said. "But mostly people want me to help them so it is kind of the opposite of what you may think. People are for it." Last year Grammy-winning musician Annie Lennox tapped Roseman to make a video retrospective of her career. "I wanted to sum it up into one cohesive mashup that all made sense," Roseman said. When Roseman isn't contracted by artists or brought into nightclubs for spinning gigs, his product is free. Because he samples other people's work, he can't legally sell what he creates, so he truly is just creating mashups for the love of the music. Roseman was recently booked to speak and to spin at the World Fair Use Day in Washington and he has recently been in high demand. New Year's Eve found him spinning at the massive Siloso beach party in Singapore. "He's blowing up right now," said M. Tye Comer, executive editor of Billboard.com. "He has done this [United State of Pop] a few times now and he is getting better at his craft." Comer believes that the success of Roseman's work speaks to the way people consume information today. "People are more apt to discover things online, and I think the time was right for his talent and his technique to be consumed. I think the stars aligned," Comer said. In 2007, Roseman created his first United State of Pop mashup, which included, Gwen Stefani's "The Sweet Escape" and Fergie's "Big Girls Don't Cry," on the suggestion of his manager, Rodney JeanBaptiste. Roseman, 40, had done a mashup of 22 songs from the year when JeanBaptiste encouraged him to include The Fray's "How to Save a Life," which was number 24 on the Billboard chart that year. JeanBaptiste said it was silly to do 23 or 24 songs instead of a number like 25 and hence christened the mashup, "The United State of Pop." "I wasn't from the outset trying to make a comment on how the year was or wrap it all up," Roseman said. "All I was thinking with the first one was let me collate all of pop into one state. The first year it happened accidentally." He did it again in 2008 and again for 2009. By the time 2009 came around, Roseman thought in addition to putting together all of the hit songs from the year, he could also make a statement about society at year's end. "I decided to sum up how things are and make a cohesive statement," Roseman said. "I tried even harder this year to try to make a comment on where we are, and I felt strongly there was this new message in pop music. The 2009 remix relies heavily on the theme of perseverance, using the lyrics, "baby don't worry," from Jay Sean's "Down" and "let's live it up," from the Black Eyed Peas' song "I Gotta Feeling." Roseman even found meaning in Miley Cyrus' "Party in the USA," but unfortunately it didn't make the final cut. "I wanted to express that times are tough right now but music is here to heal us and to make us feel better," at least right now," Roseman said. The name Earworm, which is typically confused for things like earwig, comes from the German "ohrwurm," for a melody that gets stuck in your head and you can't get it out no matter how hard you try. "I thought it was a worthy goal and took it on as a moniker," Roseman said.